Marble is one of the most elegant flooring materials you can select for your home. All natural, it is harvested from a mountain in excellent slabs of stone, which is then refined and sliced down into the individual tiles, mosaics and slabs that are used in standard flooring processes. 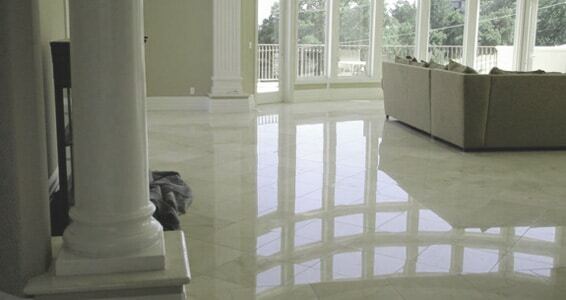 Throughout history marble flooring has been associated with a sense of opulence and wealth. It’s a material that has decorate the palaces of kings and queens, and it also used in some of the great works of architecture and art produced throughout history of humans. When installed in a home, it can create a sense of sophistication that will illuminate the room atmosphere. Marble slabs and tiles are available in a large variety of colors. There are also multicolored marble materials to choose from, which feature a variety of hues arranged each piece in the surface. With marble being a natural flooring material, each piece is going to have a slightly different look from the other, giving each tile its own unique personality. When marble is extracted in large sheets it’s called slabs. Slabs contain natural features that create a beautiful combination of colors across the surface of the piece. When the slab is cut down into more manageable sizes, each piece is a section of the original natural picture. It’s typically impossible to perfectly reassemble these pieces, a floor installation of a single material will showcase the pieces that tend to favor one another. Marble was created by the earth and is an all-natural material. This means that marble it is eco-friendly and bio-degradable, and will not create pollution at the ending of its functional life. Unlike a lot of other stone flooring materials, marble is a stone surface that hard and can take an extremely high polish. This allows the surface of marble extremely shiny and smooth. Polishing also tends to enhance the colors in the stone, making them more dramatic and noticeable. For further information about marble floors and why their great addition to your home contact the natural flooring experts at Modern Stone Care.